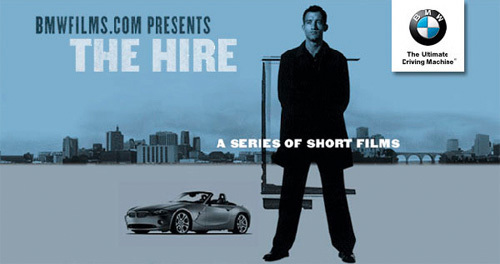 After watching the Parallel Lines series, my desire to revisit BMW’s The Hire was too much to contain. This thing was a cultural phenomenon, doing what no one had ever done, with a medium still untested at the time. Back in 2001, households across America were still learning about the internet; installing their dial-up connections to surf for mostly news articles and sites without too many images for quick access. Looking to tap into a market that could target its demographic of wealthy, tech-savvy, young adults, the luxury car brand—along with producer David Fincher—hatched a short film series with its new line of cars as the lead character. Facilitating a working environment that attracted an insane level of talent, big-time directors had the money and support to try their hands in an experimental capacity, getting in at the ground floor of what would soon become a gold mine for advertisements, viral marketing, and international exposure no one could quite see coming. While pretty much a glorified commercial for BMW vehicles—these shorts all contain a car model that serves its role to the plot as it shows off features such as front/back seat temperature controls, expert handling at high speeds, and crash safety with its strong skeletal structure—each is also a piece of art that fits in its respective auteur’s oeuvre. A couple wrote the scripts themselves, screenwriter Andrew Kevin Walker, (who wrote Fincher’s Seven), pens a couple, and David Carter fills that duty on most others, each script a tightly wound adrenaline rush of sights, sounds, and tons of action. One could say the Crank series owes a lot to Fallon Worldwide’s vision of taking this chance on web advertising, revolving each around a singular character with expert control over the BMWs at his disposal—Clive Owen’s Driver. Sticky situations are solved by the automobile’s maneuverability rather than Jason Statham’s kickboxing attitude, but you get the idea. Owen himself also reaped the benefit of his role, finally moving him from just a British name to a Hollywood celebrity carrying an epic like King Arthur as his first starring role less than two years later. In order to give you an idea of the talent involved, I will list the director, writer, and actors of note for each short. Lasting anywhere from five minutes to ten in length, every film wears the stamp of its creator proudly and shows first-hand what the product on display can do—something no amount of print advertising could hope to achieve with static imagery. One of the shortest installments, Ambush is also one of the most effective in tone. Beginning right when a rogue van pulls up next to the BMW, requesting them to pull over at gunpoint, the action is top to bottom as Owen’s Driver does what he has to in order to shake the bad guys. Gunfire aplenty and no stranger to explosions, we even get a nice exchange at the finale to lighten the mood and make you wonder what could have happened if Milian’s fence wasn’t quite so quick on his feet. Chosen shows that the series can be as beautiful as it can be kinetically laced with gunpowder. The action is still prevalent with prospective kidnappers looking to take the young Tibetan boy the Driver is tasked to safely deliver to handlers in America, but Lee utilizes orchestral sounds and even a choreographed dance of cars along the night skyline of the city. Infusing his own Chinese culture with the clothing and bronze statuary he lingers on in close-up, don’t blink towards the end as young Mason Lee, (Ang’s son), leaves a gift to be revealed as not only proof of the Tibetan people’s otherworldly powers, but also a cameo of the director’s next film’s star. Here is the piece we see the full capabilities of advertising as an art form. Like Lee before him, Kar Wai’s use of music is stunning, especially when juxtaposed against his trademark frames of soft focused beauty. Pitting Owen against Lima on behalf of her movie star husband Rourke, who believes she is cheating on him, The Follow takes us through nightscapes of reflections and the effortless movement of Beemers on the winding city streets. High-octane flash isn’t necessary here, only a stage for which to show the machine’s mix of looks and cunning—Lima and her car doubling as the vanishing woman able to take care of herself. What always was my least favorite of the bunch, partially due to the fact the director and star’s courtship was at that time ruining his promising career, watching Star again shows how much is hidden if you pay enough attention. The job for the Driver is a sort of payback for his bitchy passenger’s lack of humanity towards her employees and the drive is one of bumps and speed changes, throwing her to and fro in the backseat. But besides that simplistic summary, there is also the fact this is the one entry that lets Owen be goofy and have fun. A welcome change of pace that sees him with broad facial expressions and even one instant driving without hands, I couldn’t help but applaud Ricthie’s ability to keep the fast-paced speed while also infusing a great sense of humor. Closing out Season One of the series is Powder Keg, a gritty, grainy piece that fits perfectly into the filmography of its director. Concerning a photojournalist named Harvey Jacobs, played by Skarsgård, Owen must transport him out of a war zone to the American embassy, smuggling his new rolls of photographs. 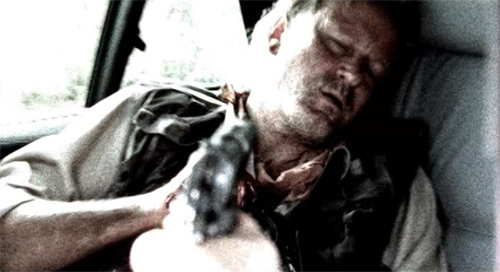 Dying of a gunshot wound, Jacobs begins to have an epiphany about his life and how his sacrifices could be meaningful if even one of his images could do something to instill change. Powerfully dramatic in his words and heartwrenching in its conclusion as Owen fulfills the promise he made to the photographer, Iñárritu does what he does best. Season Two of The Hire pushes the envelope with even better production value, due largely, I’d assume, to only having three parts rather than five. Not only are set pieces more impressive, but the stories also get darker and more cinematic in their ten-minute runtimes. Hostage includes an effectively orchestrated car chase between Owen’s Driver, searching for a woman slowly drowning, and the local police unaware he’s working for the law as he speeds away. Woo’s goal was to go bigger than all the previous films with high-risk stunts and even an underwater scene, infusing his blockbuster action to a script that pays off with its own little surprise at the end. If I were to choose an overall favorite of the eight entries, I do believe Ticker would narrowly beat out The Follow. Something about Carnahan’s use of flashbacks to tell intricate stories, when one would think pyrotechnics are the most important aspect, has always endeared his work to me. Amidst the gunplay and Owen’s speedster driving at the necessity of Cheadle and his handcuffed briefcase ticking and spouting fluid, is a story that resonates on both a political level as well as a human one. Containing the highest stakes by far, the moral quandary that is hidden in the background pushes forth as we begin to question ourselves on how far we are willing to go to save one life, especially when that of so many others rests with the decision. And here is where it all culminates into a full-on assault of your senses. Who better to show the BMW’s flashy speed than he of kinetic jump cuts Tony Scott? 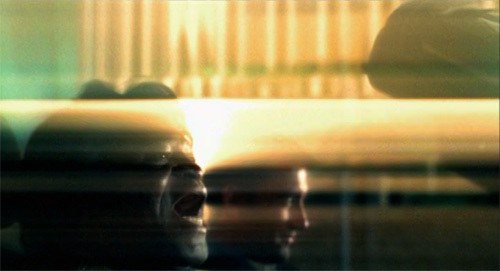 Beat the Devil is a definite precursor to his cinematic renaissance with Man on Fire and Déjà Vu. Utilizing superimposed text, tempo changes that go from fast to faster, seamless jumps from present to past, and a choppy fluidity that could only work in an MTV-generation of the attention deficient, Scott has put together an epileptic’s nightmare of action, comedy, and surrealism. Brown is looking for a restructuring of the deal he made with the devil, (Oldman), for fame and fortune. Telling his Driver that anything said is just crazy talk, the Godfather of Soul ropes Owen into a race to either lose his own soul or win his client eternal youth. With the BMW’s smooth shifting to full gear as the neon lights of Las Vegas blow past, not even the Prince of Darkness can match up with the precise engineering of Germany’s finest. So there you have it, BMW’s The Hire—the first of its kind that has been modeled from and remade for almost a full decade. The technology has improved and the costs have made it possible for web-specific shorts to be helmed by up-and-comers rather than stalwart legends, but you just can’t ever beat the trendsetter. Watching the series right around the time I began to seriously invest myself in film and the cinema only places it on a higher pedestal, adding that little bit of sentimentality and nostalgia. I’d love seeing a revisiting of the idea as a ten-year anniversary marketing push, but since so many regularly released movies and TV shows use product placement now, the expenditure just isn’t cost effective anymore. It’s a shame, but it also makes sure the original stands alone as the masterpiece of conceptual ingenuity it is.